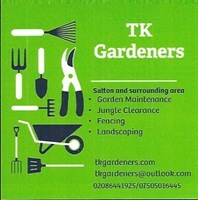 TK Gardeners - Garden Services based in Cheam, Surrey. I started TK Gardeners in 2015. I retired from the Met Police Mounted Branch after 37 years. Of course, my wife was never going to allow me lazy days enjoying golf and sports channels and I wanted something to keep me active fit and healthy (note to self beige food and cafes should be avoided). Starting my own business in gardening made sense. My family has always been involved in fencing and landscaping and I have kept up my interest over the years. I have been fortunate to work with a great team of staff, Darren, Fity, Faye, Daian and Phil (the driver). All reliable and honest people. The plan is to keep doing what we do well and keep our customers happy.